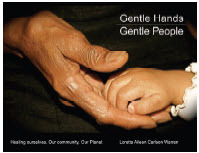 Loretta Aileen Carlson Warren is the author of Gentle Hands, Gentle People: Healing ourselves, Our community, Our planet. She won a first-place EVVY for the categories of Spirituality/Inspiration and Self-help. Gentle Hands, Gentle People also received a second place EVVY in the Parenting/Family category. In addition, at this time, Loretta also received first place winner awards in the Spiritual Category at the San Francisco Book Festival and at the New York Book Festival. Recently, her book was received by and shown in the 2012 Harlem Book Fair on July 21, 2012, in Harlem, NY. Loretta Warren accepts her EVVY Award from Jake Jabs. mother and grandmother. I have a partner whom I cherish and am grateful. I was born and raised on a farm in Northern Colorado and am a third generation Colorado native. I come from a loving and caring extended Swedish American family. I have two grown daughters, and numerous grandchildren of origin and of choice. Some of my passions are: family, my work, music, animals, traveling, Colorado and the outdoors in the summer, learning and more. In the early part of the new millennium, I was diagnosed with malignant Carcinoid tumors for which I had surgery. I have always been a woman of faith focusing on my Spiritual Growth. Being told you have a condition that could be life threatening is a wakeup call. This wakeup call pushed me to prioritize what was important in my life. At the top of my list was: family, friends, my spiritual life and the need to surround myself as much as possible with gentleness. A few years earlier, I had already begun studying photography and taking shots of hands. Hands are the healing tools of nurses like myself as well as other health care workers. I have always been fascinated with how much character one can see in the hands of others. In addition to my photography, I completed a two-year course in Spiritual Direction. This led me to continue my studies at the Sophia Center at Holy Names University in Oakland, California. 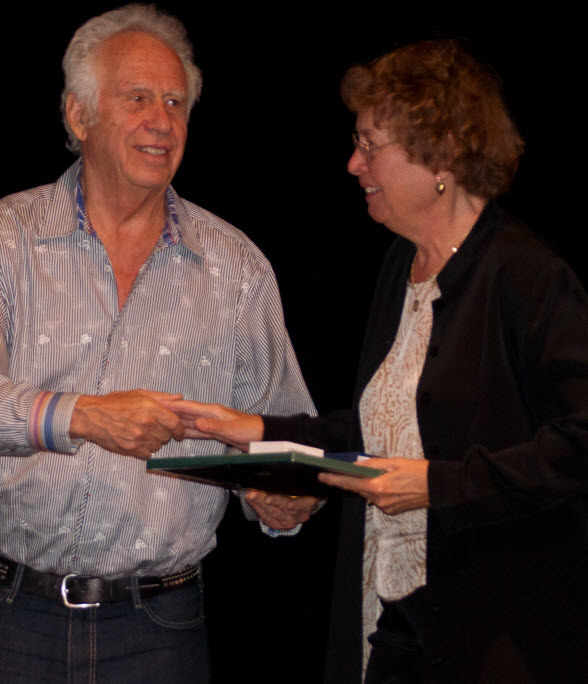 The Master’s of Art degree that I was awarded is in Art, Culture, and Spirituality. A final paper or project was required to complete my MA. My decision was to combine my photography of Hands, with essays, poetry, writings of myself and others, defining Gentleness. It was then that I felt inspired to explore the concept of Gentleness, which led me to self-publish Gentle Hands, Gentle People. My professors were very pleased and encouraged me to have the book published by a bona fide publishing company. After graduation, I sought out a publishing company, called Classic Day Publishing and connected with the owner of the company, Elliott Wolff. After reviewing my self-published book, he was favorably impressed and suggested that I create a section on “Transitions” and have it published professionally. This resulted in a huge learning curve for me. With a lot of commitment and work on the part of all involved, I am left with a finished product that I feel very good about. Why did you decide to independently publish your book? What has been your experience with CIPA? Not knowing the publishing industry, I began researching on the Internet, reading articles, reading books and talking to people in the industry. I obtained the information about CIPA from people at the Tattered Cover Book Store. I then started attending meetings. There, I learned that independent publishing was possible. I found everyone cordial, and always, very open and helpful for people like myself who knew very little about the industry. I am sure without the guidance and information I obtained from CIPA, I would never have had the self-confidence and information to take my Mac Published Book and have It beautifully done by an Independent Publisher. I am very grateful to the CIPA organization and everyone connected to it. I have several projects in mind that would again combine my photography and narrative but nothing currently in the works. Stay Tuned! Loretta’s book is beautiful and meaningful especially in these difficult times globally. I believe that it ought to be translated in many languages since the photography is totally universal as is the narrative. This way it could reach many many people throughout the world who would thoroughly enjoy it.